A late night arrival in a new country means some major disorientation on Day 1. Combine that with the fact that shadows point south, not north, and my head starts to spin. After one day in Quito, I’m happy to spend an evening hibernating in my room and processing what I know is a little bit of culture shock. 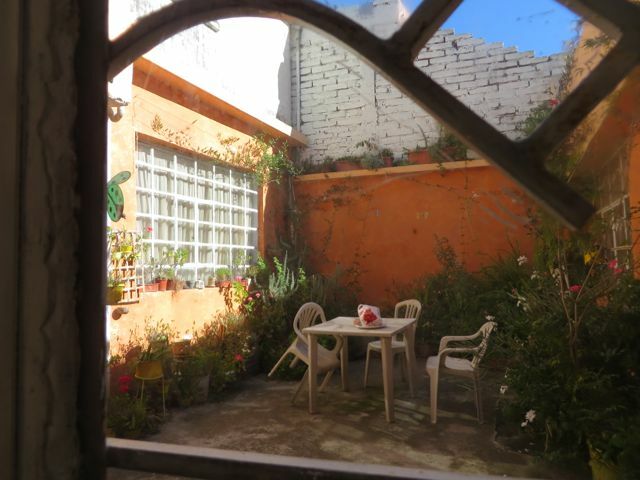 Morning sunlight in the courtyard outside the bedroom at my Quito B&B. And if you’re wondering why I have only one photo to show you after a full day in the city…well, one of my ways of adjusting is to leave the camera at the B&B in order to keep a low profile until I get a better feel for a place. It’s bad enough that I occasionally have to stop and look at the map I keep folded in my pocket. I can’t help looking like a foreigner. But I can avoid looking like a clueless foreigner.